While the other daycare children play together, Clara is playing alone repeatedly spinning a color wheel. Robert isn’t saying the words friends his same age have been saying for months. As an infant Kyle didn’t make eye contact when you picked him up and at 16-months, he’s showing no interest in walking or talking. Parents of Autistic children saw these signs but didn’t act right away because they didn’t think it was a big deal – or they didn’t want to act ‘pushy’ by asking for a special pediatrician’s appointment. No matter how many books or baby blogs you read, you’re just not sure what to expect. And many parents want to be careful not to add to untrue waves of online posts saying we’re in an Autism epidemic1. So when is it safe to ask if my child is Autistic and has delayed development? Let’s begin by considering some valid, reliable information. The U.S. Centers for Disease Control defines Autism as an impairment of social interaction. It is a complex neurological disorder that is part of a group of three conditions that were once diagnosed separately but are now collectively called Autism Spectrum Disorder (ASD). The three conditions are autistic disorder, Asperger syndrome, and Pervasive Development Disorder Not Otherwise Specified (PDD-NOS). Asperger syndrome can show as clumsiness due to a delay in motor development as well as a child’s difficulty in speaking with others. But children with Asperger syndrome do not show the significant delays in cognitive or language development as seen in Autism. PDD-NOS is often diagnosed for children not fully meeting the criteria for Autism or Asperger syndrome. Autistic disorder affects how a child communicates, interacts, behaves and learns; it does not affect how they look. The abilities of autistic children can range from gifted to severely challenged. ASD affects 1 in 68 children in the United States. It holds no racial, ethnic, or socioeconomic connections and it is 5 times more common in boys. Diagnosis is valid at age 2 but there is work being done to create valid diagnosis of early signs of autism in babies at 9 to 12 months2. 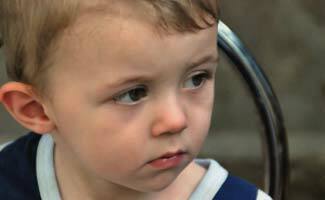 The first signs that a child may be at increased risk of ASD involve speech development. No babbling by 1 year, no single words by 16 months and not putting 2 or more words together by 2 years of age are all common signs. Other common signs involve delay in what the child understands as well as attention to what is going on around him. Not responding to their name at less than 1 year, not responding when somebody points to something and not pointing at objects of interest such as an airplane overhead or a passing fire truck. Children with ASD also are less likely to draw attention to themselves by showing you what they are doing. Step one is having a conversation with your pediatrician during your well-child visits about what you see in your child’s behavior that raises concern about their development. The well-child pediatrician visit is where you should discuss development concerns or questions begin at 9 months of age. Then again at 18 months and 24 months. Children are at higher risk of developing signs of ASD if there were problems in a preterm birth or if he had a low birth weight. Parents of one child with ASD have a 2 to 18% higher chance of having a second child also affected. There is no blood test or medical procedure to diagnose ASD. It takes two steps of screening and evaluating a child’s actions and behaviors. Two questionnaires are designed to initially evaluate children 16 to 30 months. The first is the M-CHAT (Modified Checklist for Autism in Toddlers) and the second is ATEC (Autism Treatment Evaluation Checklist). The second step of diagnosis is a comprehensive evaluation by a specialist. This involves interviewing parents to review their child’s behavior and development as well as screening the child’s hearing and vision, genetic testing, and neurological testing. Specialists who conduct a comprehensive evaluation are developmental pediatricians (special training in child development), child neurologists (specialize in the brain, spine, and nerves) and child psychologists or psychiatrists (specialize in the human mind). Since there are no medications that can cure ASD, the list of treatment options runs deep. Some medications may help one particular child function better by managing energy levels, focus, or seizures, but those same medications may affect another child differently. Types of treatments follow four main categories. For a behavior and communication approach you must provide structure, direction and organization. This can be as simple as reinforcing positive behaviors and discouraging the negative. Some methods teach steps toward a desired behavior. This can also involve speech, sensory and occupational therapy such as teaching a child to dress them-self. There are also many apps that can help with the treatment of autism. As mentioned, no medications exist that cure ASD. The U.S. Food and Drug Administration approved the anti-psychotic drugs resperidone and aripripizole to address tantrums and aggression in certain age children. Options outside the common recommended medical treatments fall in this category. They include the removal of heavy metals like lead from the body (chelation), deep pressure treatments, or biological/hormonal treatments such as secretin. As with any treatment plan, discuss options and recommendations with medical specialists before taking any action. When you attend your next well-baby visit, talk with your pediatrician as they examine your child and ask about each developmental milestone they recognize or do not recognize. Early recognition (as early as 9 months old) and intervention can make life better for those with Autism as well as those helping the autistic.